I'm Christina, Gran to three beautiful wee toddlers. I'm also a wife, a mom, a sister, a friend. My family means more to me than I can ever say. And... I sew! In my heart of hearts, I love hand embroidery ‒ the finished work is just SO pretty, and you can literally work on it ANYWHERE! Yep. I arrived for work each morning with a target on my forehead. When I was young, I lived for the day that I would have children of my own. I never wanted a career, or to travel... I only wanted a family. 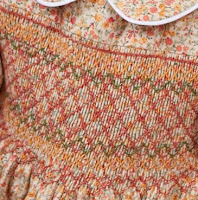 In my dream, my little girl was named Kate, and she wore smocked dresses. 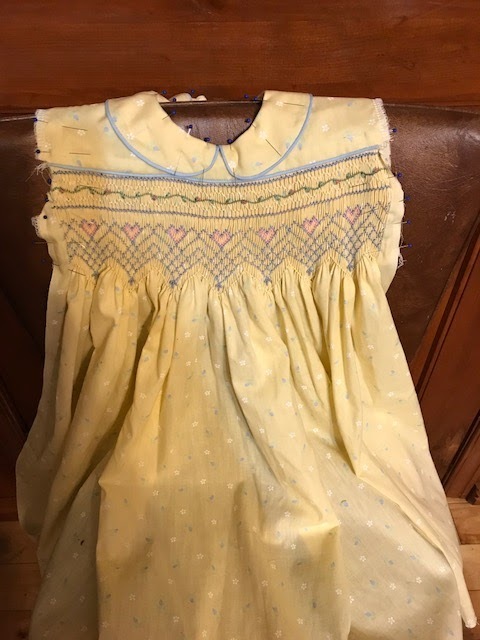 So, long before I learned to drive or even met my husband, I learned to smock. 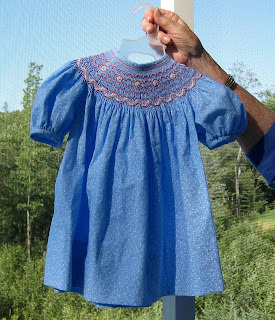 Fast forward many years, we did indeed have our wee Kate, and she did wear smocked dresses. For a few years, anyway. Then came t-shirts and sweatpants, and the dresses were a thing of the past. Fast forward many MORE years, and – Oh! Be still my heart! – we have grandchildren! Three, to be exact. 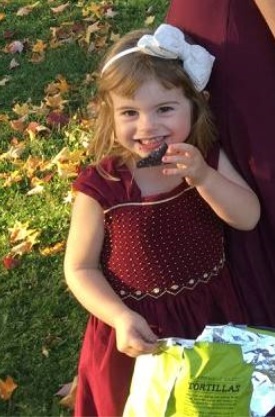 And among them are two little girls, Olivia and Lauryn. Only two months apart in age, I once again can pour my heart into garments for the wee girls I love more than life itself. So imagine my joy when Lauryn's mother Lyndsay asked if I would make her an Easter dress. I cannot even. And here is Lauryn's first Easter dress, complete with matching diaper cover. I cannot wait to see her in it! 1. 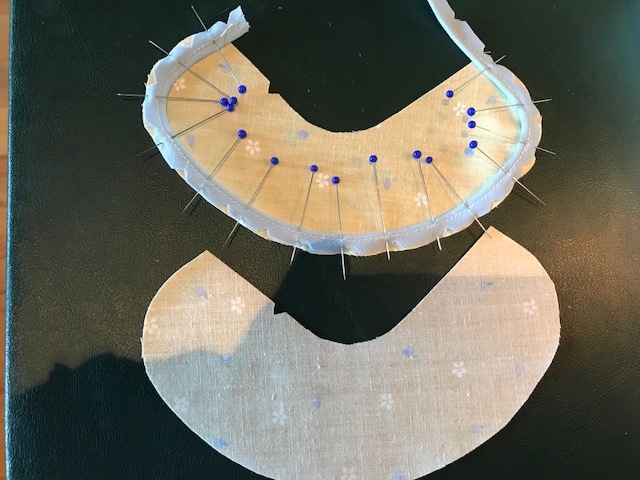 Adding piping to the collars. 3. Back and front shoulder seams stitched and pressed. 4. 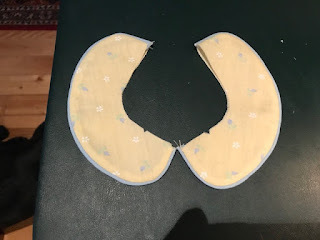 Collars stitched in place between the dress and bodice/back linings; the linings have been turned to the inside. 5. Back placket and button loops stitched in place and pressed. 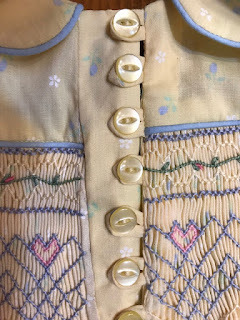 *Normally, the buttons on the left back would be placed on top of the smocking so that, when buttoned, no placket would be visible. Because we were concerned that the neck was too small for Lauryn, I made a FNA (full neck adjustment, lol) that you can see in the next photo. I only gather the sleeve cuffs after the sleeves are stitched in place, and the arm and side seams are complete. I don't have a photo, but after the sleeves are stitched across the shoulders, it's an easy seam on the underside of the sleeves, the underarm, and straight down the side. The only trick is ensuring that you've caught all of the side seam allowance in the seam, and the smocking lines up as one continuous pattern front to back. 8. I had to scrounge for a pattern for a diaper cover, but finally found one that would work. 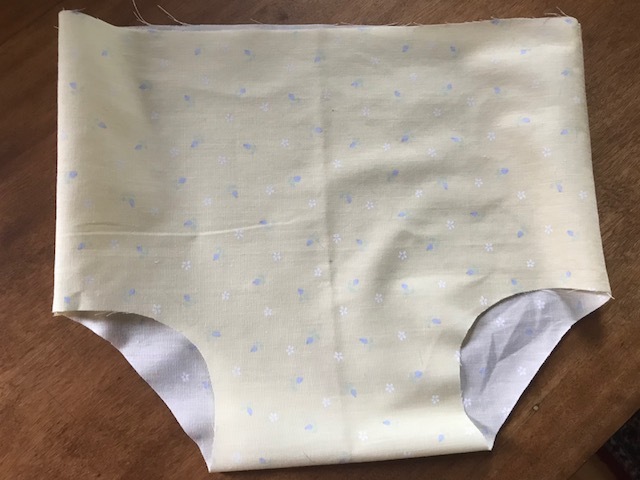 Side seams are stitched and pressed, and the only thing left is to add the fabric bias for casings and add the elastic. Obviously, some habits die hard. Like the one where I neglect to post. This will be a quick post -- a post made possible because my daughter Kate's wedding photos arrived! And I can finally share professional-quality photos of my favourite project EVER: ring maiden Lilyrae's dress for Kate's wedding. 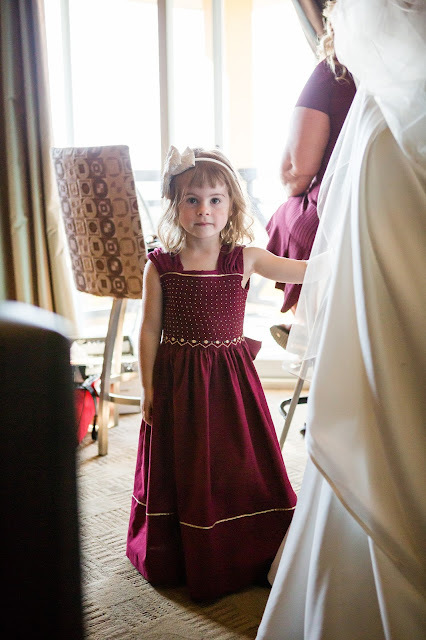 The dress is Elodie from Perfect Party Dresses, by Susan O'Connor. Special shout-out to Phillipa Maitland, who captured this beautiful wedding exquisitely! 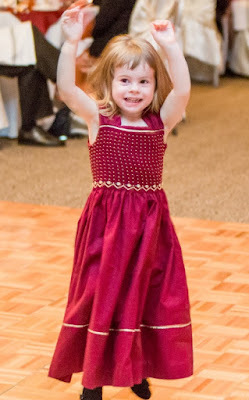 and even more perfect for dancing! 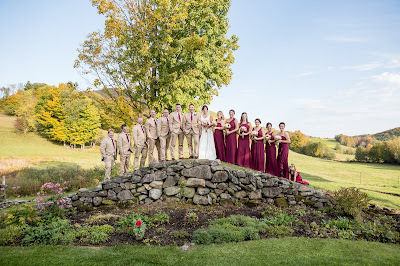 I was so very pleased to be able to contribute a little something special to this perfect day. 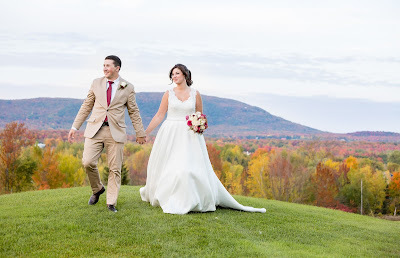 Here are some pictures of the happy couple. 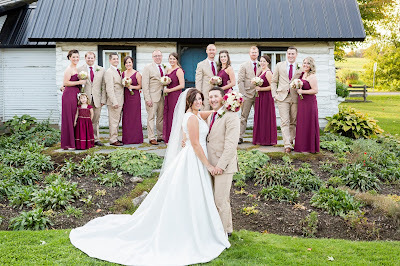 To Kate and Chris, love and happiness always! If I'm not mistaken, the last time I posted on this blog was a little over six years ago. Six. Years. Ummm... I've been busy? It's not like I haven't been smocking -- if anything, I've smocked and sewn more than ever in these past few years. My only excuse for not posting is that the last six years were terribly difficult years for me. 'Nuff said. Things have turned around now, and I finally feel like I'm in a good place to be sharing myself once again. I'm So let's all see if I do better *this* time around, shall we? In the past six months alone, I've smocked and constructed 7 dresses for wedding flower girls, etc., and one baptism romper for... drumroll here... my GRANDSON! Yup. I'm a Gran. My lifelong dream has come true, thanks to my son and the adorable love of his life. No one ever prepares you for how awesome it is, but trust me -- it is so, so much more than wonderful. There are so many things I want to make for him! 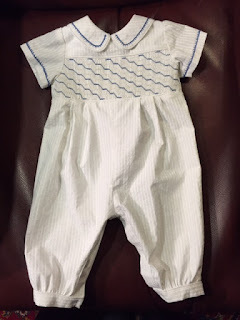 I've made the one and only smocked garment that his father will allow him to wear, so I've invested in an embroidery machine and plan to sew and embroider all kinds of things for him to wear in the weeks, months, and years ahead. 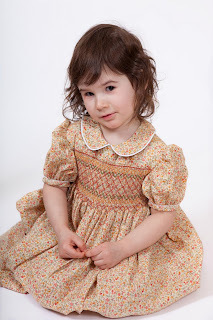 All the while, I will continue to smock, teach smocking, and will now even sew garments for myself. Cause it's all just SO much fun! 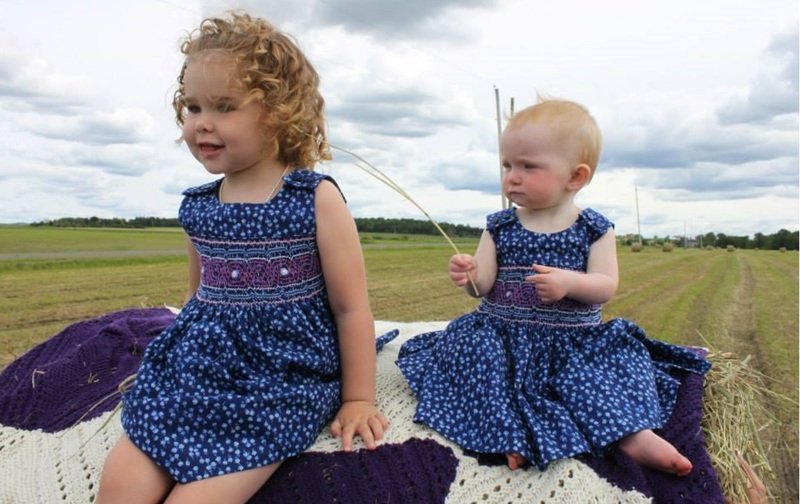 Matching dresses for two little wedding beauties! was actually sent to me to smock! For now, it just feels good to be back. Where did the last 6 weeks go? I completed two custom orders (one 'Amy' and one 'Mary De', both by Children's Corner). 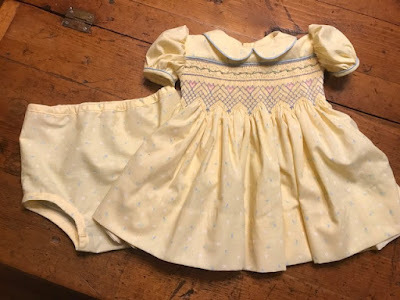 I finished the smocking on a new bishop dress (size 3 months). I completed most of the smocking on the bodice of a dress I'm designing myself. I started a 10-week fashion sewing course (to upgrade my self-taught sewing skills). We've also had fantastic fall weather here in Eastern Canada, so that means we've been trying to get outside and enjoy the warm(er) temperatures before our winter arrives. Winter here normally begins in late November and lasts until late March -- and brings with it lots and lots of snow and freezing cold temperatures. (We have pictures from two years ago in which our snowbanks were as high as the top of our garage!) Although the winter is long, it means that I get to do a lot more sewing! Most of the smocked dresses that I've made to date are summer outfits...so I am looking to branch out and begin producing fall and winter dresses made from warmer fabrics, and with long sleeves. Remember how I said in an earlier post that I had been asked to supply the gift shop at our local hospital with some of my garments? 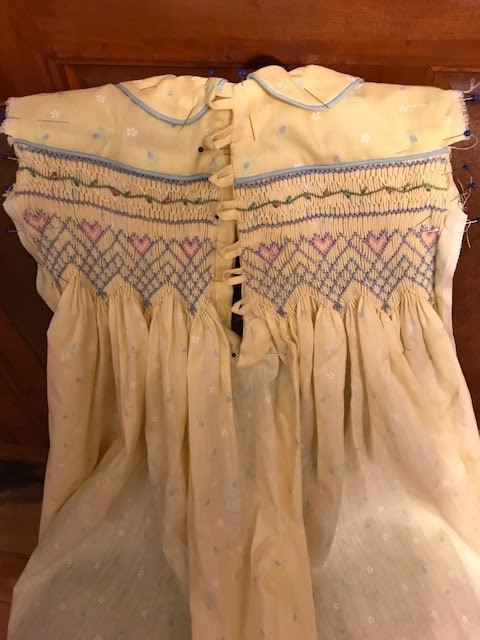 Well....... on Tuesday, July 8th I took over a dozen garments -- different styles and sizes -- and they chose to start off with four: three smocked jumpers with white blouses (matching piping on the collars and sleeves), and one short-sleeved smocked dress. We agreed on a price, and I suggested that I would get in touch in a month or so to see whethe r they had sold. Believe it or not... and I AM NOT KIDDING... they called on Friday, July11th to tell me that three out of the four had sold! And to ask if I could deliver more. 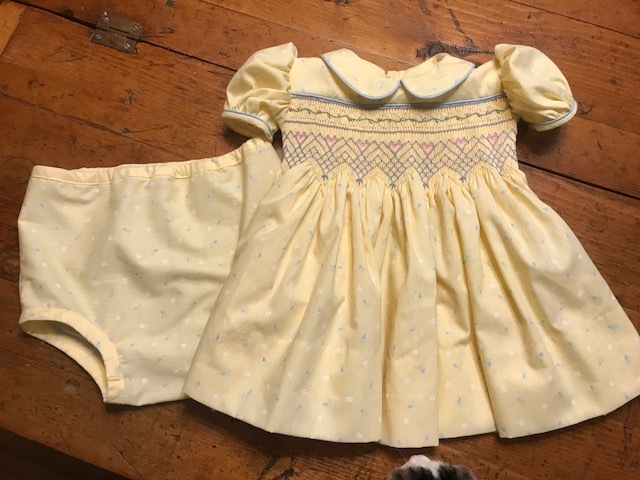 Three garments in three days! Woot!! So needless to say, I am busy, busy, busy. But in a good way! I have found time, though, to take our two yellow labs, Tanner and Maddie, out to swim some laps at a nearby quarry a few times in the past two weeks. They LOVE the water, and would retrieve their toys (large dowels inserted in 12" sections of pool noodles) all night if we let them. I'm happy to report that I've finished another order! This pattern -- Amy by Children's Corner -- is a really popular style. Probably because it can be worn as both a blouse & jumper and a summer sundress. Yesterday, I pleated the fabric for two identical bishops dresses, size 18 months. One is a custom order, the other is for my stock. I started the smocking tonight. I also have two blouses/jumpers to assemble -- both Mary De by Children's Corner -- one a lavender floral print, size 1 (custom order) and the other a pink floral print, for my stock. I was recently asked to stock the gift shop at our local hospital...what an honor! I'll let you know more when I have the details. Well, tomorrow's a work day, so I'd better get the dogs settled and then get to bed. G'night! I'd also like to show you some designs that I've produced that *are* for sale. I smock all the time, so I usually have many projects on the go. If you see something you like but the size is wrong, just let me know -- I might already be working on the size you're looking for. I LOVE to shop for new fabrics -- I have a great stash! There is such a great selection available in the stores now, in such beautiful colors. My stash is mostly made up of small-print quilt fabrics in gorgeous colors, although I also have a good selection of solid broadcloth. I usually start a new project by deciding upon the size I want to make; then I choose an appropriate fabric and corresponding embroidery floss (I only use DMC); then I decide upon the style of outfit. After the size, fabric, and style of outfit have been determined, I cut out the pattern pieces and pleat the fabric. 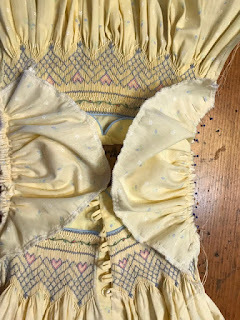 Most often, I begin smocking without a definitive smocking pattern in mind. I usually smock the anchor rows (the top and bottom rows), and then see where the fabric design takes me. This way, I very rarely reproduce the same pattern more than once. 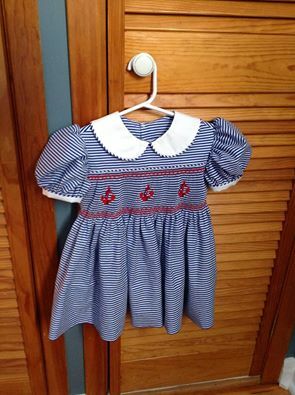 Meara is wearing a little blue sundress (size 3); the dress pattern is "Amy", from Children's Corner. (Isn't she adorable?!) 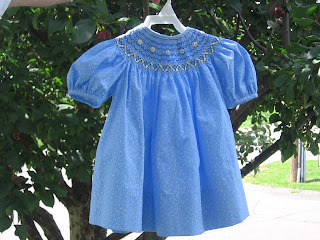 This pattern is easy to construct, and looks adorable on every little girl. 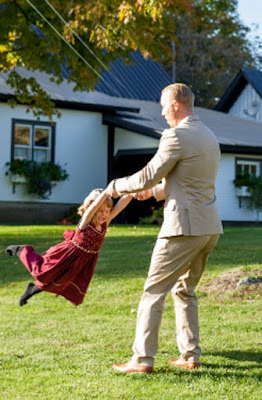 I love the fullness of the skirt -- perfect for little girls who love to 'twirl'! The pattern includes a long- or short-sleeved blouse that can be worn under the dress. I always make the blouse with coordinated piping on the sleeves and collar. 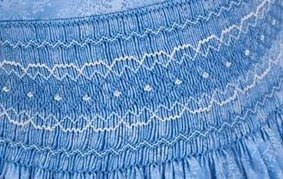 The close-up of the smocking shows the pattern. I used three coordinating colors of embroidery floss, and played with the pattern until I was happy with how I used the colors. I liked the fabric so much, I bought the companion in a lovely shade of green! Here is Meara again, this time wearing the Children's Corner dress in green with the coordinating short-sleeved blouse (also size 3). You can see how I added the coordinating piping on the sleeves and collar. 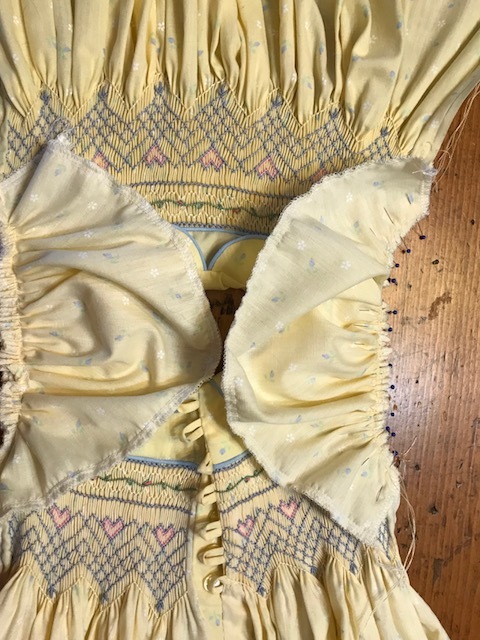 The construction of the blouse is a bit time-consuming, but worth the effort. 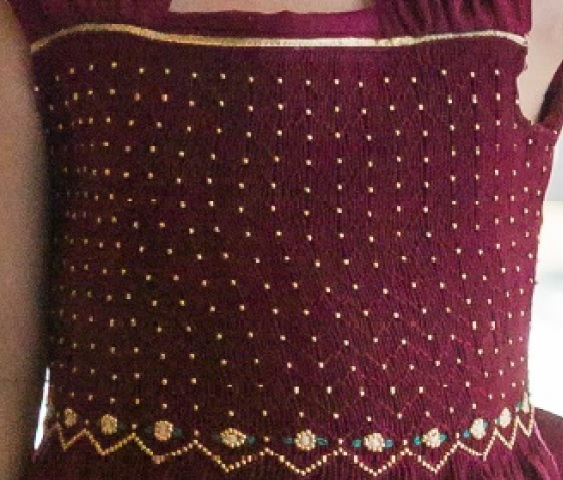 I've never yet made this pattern with the long-sleeved blouse. I had fun working out this smocking pattern, adding little diamonds to fill in the "V"s in the pattern. This pattern is smocked with only two colors of floss. 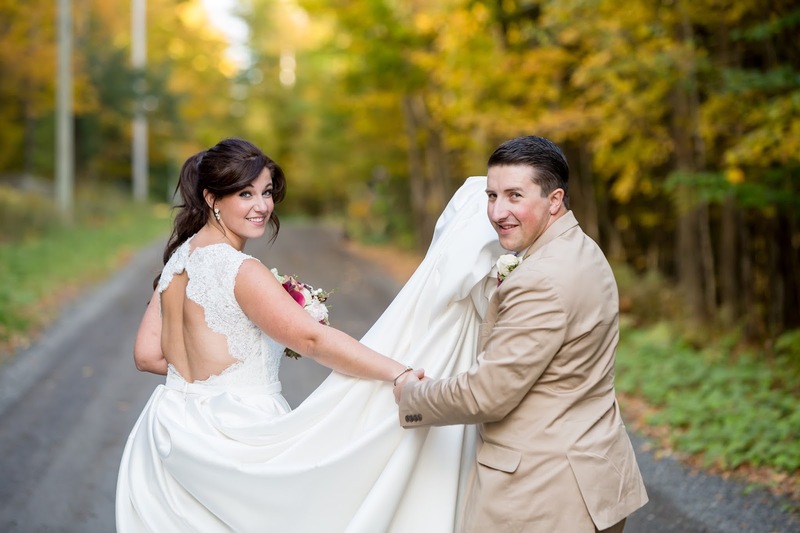 Alexia is wearing a traditional yoke-style Grace Knott dress (size 3). The fabric is a lovely floral pattern with fall colors. 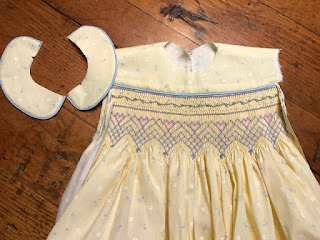 I loved the fabric but struggled a bit during the smocking, because the fabric isn't really very 'girly'. No matter... I love the result! 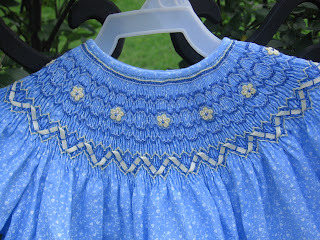 I used three colors of floss in the smocking to highlight the colors in the fabric. To provide a bit of contrast, I piped the sleeves and collar with white cotton. 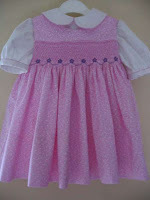 These dresses, and others, are shown on my Wee Wear Smocking Web site: http://www.weewearsmocking.com/.